Changing facets of digital media and entertainment was the center of conversations. 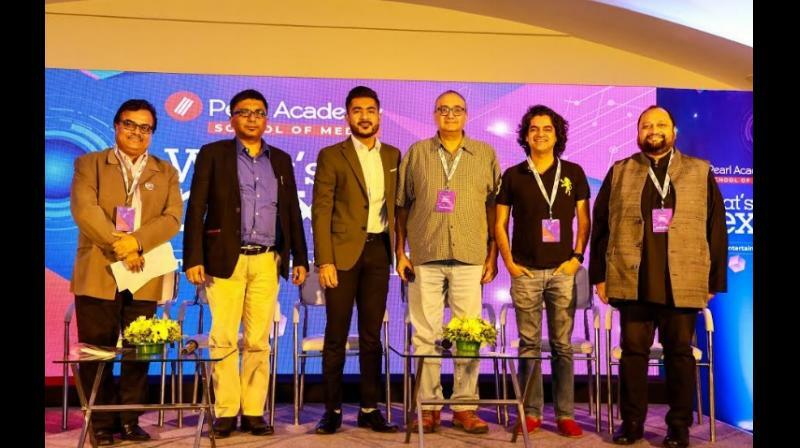 Changing facets of Digital Media & Entertainment was the center of conversations at the What’s Next Media 2019, a confluence curated by Pearl Academy’s School of Media at Waterstones Hotel recently in Andheri, Mumbai. The event witnessed prominent media and entertainment industry stalwarts and next generation media professionals sharing trends and their thoughts. The conversations during the confluence focused on three themes including the Future of Entertainment Content in the Digital Age, New Business Models in Digital Entertainment and Bridging Skill Gaps and Talent Grooming for the Digital Age. The session on Future of Entertainment Content in the Digital Age delved into the evolution of modern entertainment channels across India and the onset of mobile and multiple screens; the segment on New Business Models in Digital Entertainment brought out the need for sustainable forms of revenue beyond to keep the new age consumer interested and engrossed in a digitally distracted era. The need to explore newer business models including content marketing, pay per click, engagement economics, events revenue and crowd-funding emerged as the need of the hour in association with India’s ever evolving and fast changing media environment. The last segment on Bridging Skill Gaps and Talent Grooming for the Digital Age analyzed India’s transforming media ecosystem stressing on the advent of social media, mobile first journalism, viral trends, technological advancements with AR & VR entering the distribution and consumer channels and how each of these have contributed to creating a more evolved, modern media landscape. According to Ashish Kulkarni, Big Animation & FICCI Chairman of AVGC Council, it is important to focus on three “V” to be relevant for future - Voice, Vernacular and Video. He said, Voice gives power, future lies in the Vernacular and Video gets the maximum reach to the audience. He advised Pearl Academy students to focus on multiple skilling to be relevant to the industry at all points of time. Sanjeet Saha, Senior VP, Star Group added, “India is on the cusp of a huge revolution. There are more and more start-ups in the ecosystem now and entertainment is a sector waiting to explode. 21% of media sector has digitalized and the conversation has shifted from why digital to how much digital content.” He advised students to maximize their learning and keep the right attitude. Experts at the event represented content curation, content creation, production houses and media groups. Rahul Gangwani, Digital Head, Filmfare; Vivek Vasvani, Film Producer and Director; Mayank Shekhar, Mid-Day; Dipanjan Das, CEO, Greycells18 Media Ltd.; Mohit Soni, CEO, Media and Entertainment Skills Council and influential personalities from organizations like Viacom18, Shamiana Short Film Movement, Juggernaut Studio, Star Group and leading media houses were a part of the discourse. Speaking about the confluence, Prof. Ujjwal K Chowdhury, Dean, School of Media said, “With an objective to produce futuristic and disruptive media professionals for the digital age, Pearl Academy School of Media has continuously engaged with industry professionals. This confluence is an initiative towards the same. The suggestions, trends, facts and figures will go a long way in further evolving our pedagogy and content of new media learning at Pearl Academy through their media school." Pearl Academy, India’s leading institution in design, fashion, business and media has been a catalyst for success of the students across creative industries for 25 years. Pearl Academy offers over 30 uniquely designed under-graduate, post-graduate and professional development pathway through its campuses in Delhi, Noida, Jaipur and Mumbai. Its reputation of preparing ‘Industry ready’ professionals has been recognized by leading fashion, retail and design brands, which has helped in establishing a healthy track record of over 95 per cent placement for the last three years. Its path-breaking alliances with renowned organizations such as the Fashion Design Council of India (FDCI), Association of Designers of India (ADI) and Institute of Indian Interior Designers (IIID) have ensured that its faculty and students get exclusive access to ‘industry in the classroom’. The Academy is also closely associated with renowned global institutions such as Torrens University, Australia, Fashion Institute of Design & Merchandising, US, Domus Academy, Italy, Media Design School, New Zealand amongst many others. For more information, please visit: www.pearlacademy.com. Disclaimer: This article has not been edited by Deccan Chronicle and is taken from a syndicated feed. Photos: NewsVoir.